Quisqualis indica also known as the Chinese honeysuckle or Rangoon Creeper is a creeper with red flower clusters and is found in Asia. 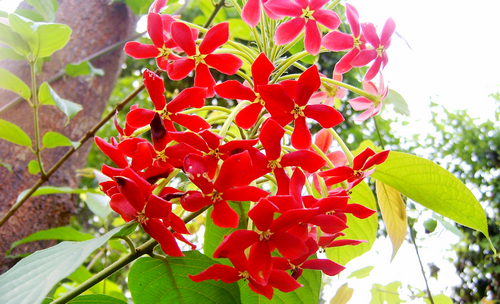 It is found in many other parts of the world either as a cultivated ornamental or run wild. The plant is mainly used for traditional medicine. Decoctions of the root, seed or fruit can be used as antihelmintic or for alleviating diarrhea. Fruit decoction can also be used for gargling. The fruits are also used to combat nephritis. Leaves can be used to relieve pain caused by fever. The roots are used to treat rheumatism.